#splettsports I hadn't worn compression socks since I was in the hospital having my son until I tried these Compression Socks. These Compression Socks are comfortable enough for daily wear, but very effective in increasing blood circulation especially near the ankles and decreases moving up the leg. Wearing these while you exercise or workout helps to warm up better, recover faster and feel stronger. 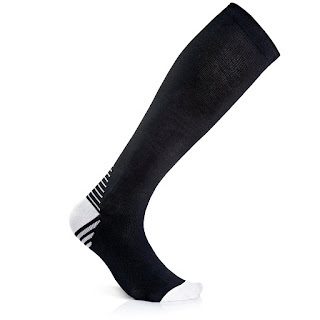 These Compression Socks are suitable for men or women and are stylish and professional looking.They fit nice and tight with no fear of them falling or sagging while exercising. They make my legs feel great! So much more energized! They are breathable and fit for daily wear. Made of 50% nylon, 10% Silver Drystat, 10% Spandex and 10% Lycra. There is a 30 100% money back guarantee, but I'm sure anyone will like them as much as I do and be just as satisfied.